3D Conformal Radiation Therapy is a radiation technique that uses computers to create a 3-dimensional picture of the tumor so that multiple radiation beams can be shaped to conform to the treatment area. IMRT (Intensity Modulated Radiation Therapy) is a type of 3-dimensional radiation therapy that uses computer-generated images to show the size and shape of the tumor. Thin beams of radiation of different intensities are aimed at the tumor from many angles. This type of radiation therapy allows us to further reduce the damage to healthy tissue near the tumor. RapidArc/VMAT (Volumetric Modulated Arc Therapy) is a form of IMRT treatment that is delivered as the treatment machine rotates in an arc around the patient. The intensity of the thin beams of radiation is continually changing to precisely deliver the treatment as the machine rotates. Respiratory Gating allows for correlation of tumor position in relation to the patient’s respiratory cycle. Using a special tracking system we can deliver radiation treatments during a specific portion of the breathing cycle or during a breath hold. IGRT (Image Guided Radiation Therapy) uses special imaging technology to pinpoint, with millimeter accuracy, the precise location of a targeted tumor for daily treatments. IGRT can compensate for any tumor motion during treatment by ensuring that the treatment beam is precisely aimed at all times. Stereotactic Radiosurgery is an extremely conformalized delivery of radiation to tumors while ensuring maximal protection of the surrounding normal structures. 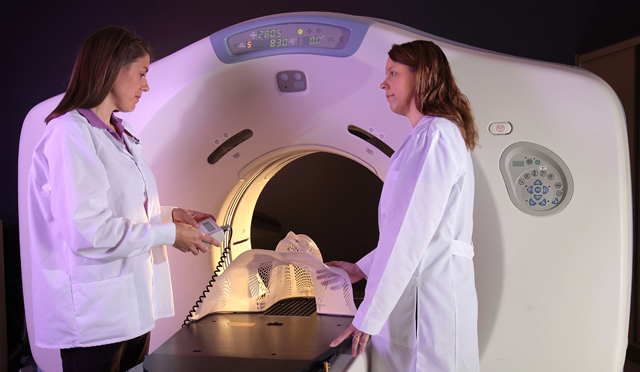 Treatments are delivered in a single session or a limited number of sessions and because of its precision, higher doses of radiation are able to be delivered than with conventional radiotherapy techniques. At RadiantCare we have the technology to deliver Stereotactic Radiosurgery with sub-millimeter accuracy to the brain and also to certain areas outside of the brain. Stereotactic Radiosurgery to areas outside of the brain is also referred to as SBRT (Stereotactic Body Radiotherapy) or SABR (Stereotactic Ablative Radiotherapy). RSI (Radioactive Seed Implants)/Brachytherapy is a procedure in which radioactive material sealed in needles, seeds, wires, or catheters is placed directly into or near a tumor. Brachytherapy is also known as internal radiation, implant radiation, and interstitial radiation.